Biathlon is a Winter Olympic Sport which combines cross country skiing with precision target shooting. There is also a warm weather variant called Summer Biathlon which replaces skiing with running. In a typical Winter race, a Biathlete is required to ski with his or her rifle over a set distance to a shooting range, where five shots at five knockdown targets 50 m down range are taken from prone position. Depending on the format, either a time penalty or penalty laps are assessed for missed shots. The racer then skiis another loop, and comes back to the shooting range for another set of shots - this time from a standing stance. Again penalties are assessed for missed shots. The biathlete then skiis a final loop to complete the race. A more complete description of the various race formats may be found here. Though a seemingly unlikely combination of events - one is an aerobic activity which requires strength, speed, and endurance; the other is a passive activity which requires concentration and a steady hand (difficult after you've been skiing all out! 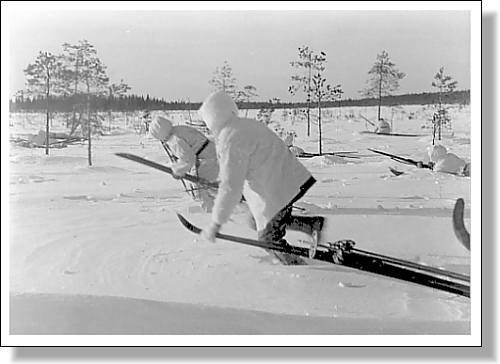 ), the biathlon concept evolved from two activities which have a long history - hunting and winter warfare. Rock paintings depicting hunters with bow and arrow moving on sliding timber have been found near Roedoey, Norway which date back to the Neolithic age (about 3000 BC). However, the first written descriptions of hunting on skiis come from Roman, Greek, and Chinese historical writings. These include such well known authors as the Roman poet Virgil, who described hunting on skiis in 400 BC. Historical descriptions of warriors on skiis also date back to before Christ, and include writings from Xenophon, Strabol, Arrian, Teophanes, Prokopius, and Acruni. Traditional military patrol races came into being in the Middle Ages. Skiing regiments were active in Scandinavia and Russia in the 1500's, and by the end of the 19th century, Germany, Austria and Switzerland also had soldiers on skiis. The first organized competitions that would be recognizable as Biathlon took place in Norway in 1776. These were team events that combined shooting skill with skiing. Competitions were held at regular intervals betwen 1792 and 1818. Around 1912, again in Norway, the team competition was joined by an individual format race during which ten rounds were fired in two shooting bouts. In the rest of Europe, Germany's first military patrol races were held in 1902. The first Olympic Winter Games in Chamonix, France included a military ski patrol race as a demonstration sport, and it was included as a demonstration sport again in 1928, 1936 and 1948. It was not until the 44th session of the International Olympic Committee in Rome in 1949 however that a proposal by Sweden to include a combination of cross-country skiing and shooting as an individual competition open to civilian competitors was accepted . The first time the word Biathlon shows up is in the rules of 1955. Before that the event was called a "Patrol Race". 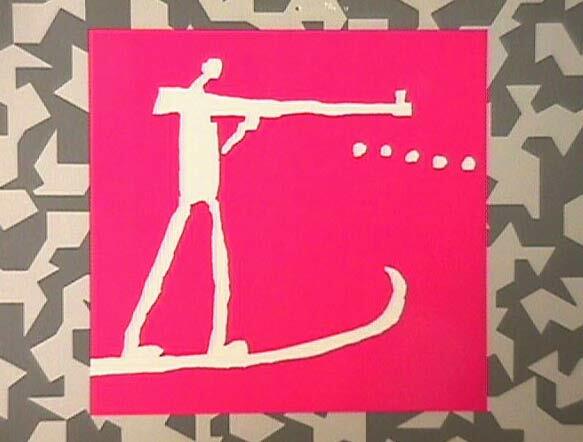 The Union International de Pentathlon Moderne (UIPM) integrated Biathlon as another sport in 1957. The first Biathlon World Championships were held in Saalfelden, Austria in 1958. Only 25 athletes from seven countries started in that first 20 km race. But the sport grew quickly. The first Olympic Biathlon competitions were held in 1960 in Squaw Valley, California (USA). These were 20km races with four shooting stations with targets set at 250m, 200m, 150m, and 100m. The first three stations were done in prone position - the last in standing. Big bore rifles were used - Winchester Model 70s in 30.06, .308, and .243 being popular among US competitors. Cardboard targets were used, and two minute penalties were assessed for misses. In the 60's, cardboard targets were replaced by glass disks. The 30 km. relay event was added in 1968, and the 10km sprint format was added to the Olympic program in 1980. The sport was made more accessible by changing the standard from the large army rifle calibers to small bore (.22) rifles in the winter season of 1977/78. Womens events were added in the 1992 Winter Olympics. 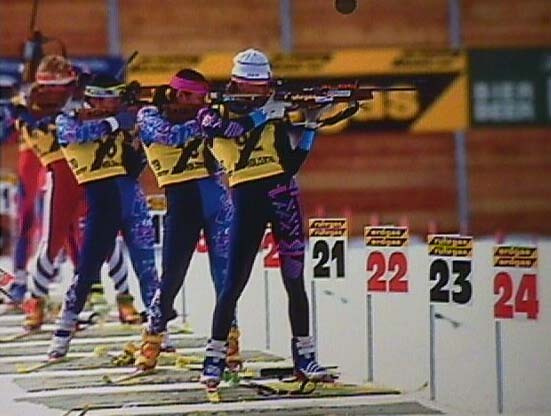 Modern technology changed the target systems, making it cheaper and easy to reset targets, the skating step increased the speed of the race, and TV coverage introduced millions of new and enthusiastic spectators to Biathlon. Currently, though it is a relatively obscure sport in the United States, with perhaps 1,000 athletes nationwide, it is the most popular televised winter sporting event in Europe.